For me Kimono is like a painting and so I gave every single Kimono I own a name. I always have been interested into art in general; I think that is the reason why I also fell in love with Ukiyo-e.
My name is Laura, born 1989 in Heidelberg, Germany. My passion for Kimono began about 3 years ago after friends of my mother gave me the book “Geisha, a life” by Mineko Iwasaki. Needless to say that I was impressed by the beauty and elegance of Geiko and their Kimono. I searched after informations about Kimono and so I found the “Immortal Geisha” forum. 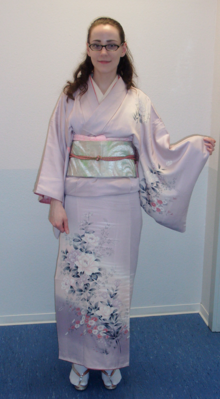 My dream about having my own Kimono was so big and one day two German member started a private kimono-sale. So I bought my first Tsukesage for a reasonable price. I try to wear Kimono as often as possible – mainly when I go to conventions or to a Japanese restaurant. My favourite types of Kimono are Kurotomesode and Tsukesage. I am not married but Kurotomesode are something special for me and so I just collect them. As for motives I like peonies and senmen the most. Kimono is not something you wear like a jeans and T-shirt, it´s a passion, something you love from the bottom of your heart or it makes no sense. It takes a while until you have a full ensemble and get used to tying the Kimono and Obi. But since I know Kimono I met people from all over the world and it makes me happy that we inspire each other and made friends.